Methane production from coalbeds involves management of two important national resources: energy, in the form of natural gas, and water. In a coalbed methane (CBM) well, pumping water from the coalbeds lowers natural water pressure in the coalbed and allows the methane that had been fixed to the coal surfaces to be released and extracted (Figure 1.1). Water pumped from coalbeds as part of this process—CBM "produced water"—ranges widely in quality and quantity and is managed through some combination of treatment, storage, disposal, and/or use, subject to compliance with federal, state, and tribal regulations. At present, significant differences exist in CBM produced water management strategies among states and between basins in the same state. These differences are due in part to differences in the composition and volume of produced water; the geology and hydrogeology of the CBM basins; federal, state, and tribal regulations; the legal categorization of water and water rights by government authorities; and costs to treat, store, and transport produced water. Produced water management is thus a challenge for regulatory agencies, CBM well operators, water treatment companies, policymakers, and the public. 1Western states cited include Washington, Oregon, California, Idaho, Nevada, Arizona, New Mexico, Utah, Colorado, Wyoming, Montana, and North Dakota; "irrigation" includes water applied by irrigation systems for agriculture and horticulture. Note that the six states considered in this study are New Mexico, Utah, Colorado, Wyoming, Montana, and North Dakota that together comprise about 36 percent of the total water withdrawal for irrigation purposes from amongst these 12 states. FIGURE 1.1 Illustration of the main features at a producing CBM well (not to scale). The black bricklike pattern represents a coal deposit lying between two sandstone units. The blue shading represents water that is present in the coal deposit. Methane gas (white dots and white shading) is adsorbed to the surfaces of the coal along cleats or fractures or is adsorbed to walls in the micropore structure of the coal matrix itself. Confinement of water in the coal by consolidated overlying and underlying sedimentary rock (sandstones in this figure) maintains the water in the coal under pressure, which in turn maintains the methane gas adsorbed to the coal. A submersible pump near the bottom of the well-bore cavity which penetrates the coal deposit pumps water from the coal. Pumping water reduces water pressure enough to allow methane to desorb from the coal surfaces and internal spaces and flow freely up the well bore. Water and methane flow through separate pipes to the surface. SOURCE: Adapted from Rice and Nuccio (2000). --Pump professional football stadiums per day with water. While this volume of irrigation withdrawals contrasts to the approximately 42 billion gallons of CBM produced water generated in five western states in all of2008 (see Chapter 2), water remains a vital resource and the effective, safe, and economical management of produced water from CBM wells is an important issue of consideration for government authorities, the general public, and industry. Natural gas supplied about 24 percent of all domestic energy consumed by the United States' residential, commercial, industrial, and electrical power generation sectors in 2008 (EIA, 2009a). That same year the nation met about 87 percent of its domestic natural gas consumption with domestic resources, primarily methane, the main component of natural gas (EIA, 2009b). In addition to its domestic abundance, use of natural gas produces less carbon dioxide and significantly fewer criteria air pollutants2 per unit of energy produced than any other fossil fuel. Natural gas has been described as a principal transition fuel to a less carbon-intensive U.S energy portfolio. Projections suggest that unconventional natural gas may lead to an increase in the growth of the U.S. gas supply through 2030 (EIA, 2010a). CBM has become a significant part of total U.S. natural gas production over the last decade during which annual CBM production in the 48 conterminous United States increased from 1.3 trillion cubic feet (TCF) to 1.8 TCF, or just below 9.3 percent of total annual U.S. dry natural gas production (EIA, 2010b; see Figure 1.2). FIGURE 1.2 CBM has constituted a significant proportion of total unconventional U.S. gas production over the past two decades. This increase in production of methane gas from coalbeds reflects an increase in the number of CBM wells beginning in the early 1980s when development of CBM was stimulated by the Internal Revenue Service's Section 29 tax credit. The tax credit included incentives for development of new energy sources, including tax credits for unconventional fuels production. SOURCE: Adapted from EIA (2009c). 2Criteria pollutants are the only air pollutants with national air quality standards that define allowable concentrations of these substances in ambient air. 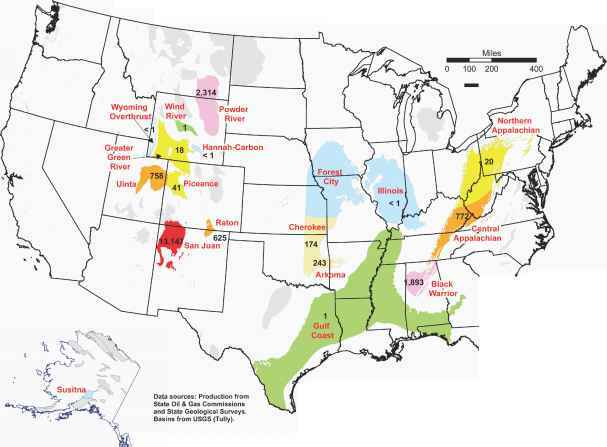 FIGURE 1.3 Sedimentary basins with CBM resources in the United States show the highest concentrations in the western United States. The Powder River, San Juan, Uinta, Piceance, and Raton basins comprise the largest currently known western U.S. recoverable resources and proved reserves (see Figure 1.4). 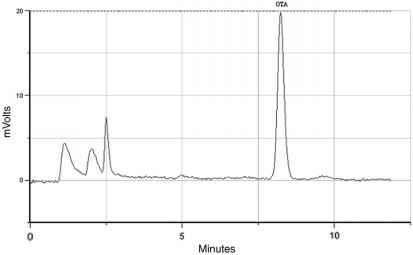 SOURCE: EIA (2007). Notes: 2006 CBM production from PA and WV not yet available; assumed to be equal to 2005 volumes for this study. Forest City Basin production is entirely in KS, volumes not separated from Cherokee portion of KS but are only from <3% of KS wells. OK volumes do not include CBM+ conventional comingled completions. vary within and among individual basins, depending on a basin's geological evolution, the grade of coal in the basin, and the hydrogeological setting of the coal deposits in the basin (see Chapter 2 for detail). Currently, the San Juan, Raton, and Powder River basins together comprise nearly 70 percent of all proven reserves in the nation (see Figure 1.4), and production from the Rocky Mountain States has far exceeded that of all other regions in the country combined over the past 10 years. The relative youth of the CBM industry in the West coupled with future demands for domestic energy and water resources indicate a continued need for effective, safe, and economical management of produced water from CBM activities. 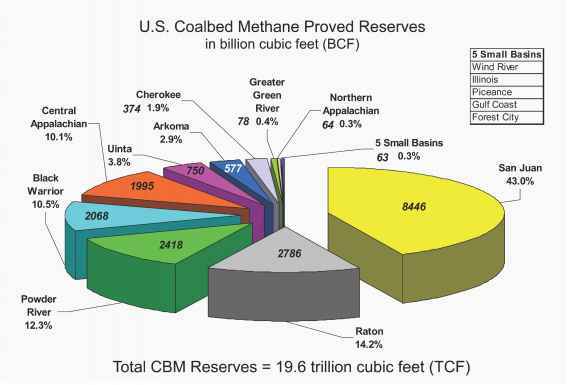 FIGURE 1.4 The San Juan and Raton basins of Colorado and New Mexico and the Powder River Basin of Wyoming and Montana contain the largest proportion of proved CBM reserves. SOURCE: EIA (2007).